206 pages | 5 B/W Illus. Economics has largely failed to provide useful insights on the HIV/AIDS pandemic. The inability of a dominant branch of social science to assist in understanding an illness with significant social, economic and emotional effects is a serious failing in its own right. Moreover, the inadequacy in its explanatory power also highlights important weakness in ‘mainstream’ economic theory, the economic approach used by most governments and institutions. This book sets out the role that economic analysis has had, and why it can be judged to have failed. This book explains how, and why, economics has been applied to a terrible pandemic, using a range of examples mostly drawn from the region most affected, sub-Saharan Africa. Part I shows that microeconomic approaches have found fertile ground in a public health approach that ‘blames’ individual choices for HIV transmission. Despite their attractiveness, however, these approaches fail to explain contemporary patterns of HIV prevalence, illustrating the importance of factors that are excluded from the standard microeconomic approach. Part II of the book looks at our problems in understanding the economic impact of AIDS, and explains why economists cannot agree if epidemic disease is a good or bad thing for economic development. 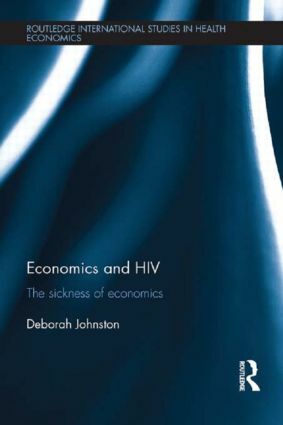 In both sections of the book, the potential for alternative approaches is shown, and the book ends by arguing that a political economy approach can bring meaningful insights to our understanding of the spread and impact of HIV/AIDS. This book is aimed at those working on African development or HIV/AIDS specifically. It will be of interest to researchers, policy-makers and postgraduate students. 1. Economics and HIV/AIDS: Failed Opportunity? Part I: The Economics of HIV Transmission: Fashions and Fads 2. HIV Transmission and the Link to the Development Agenda 3. HIV Transmissions and the Individual: 'Choosing' to be HIV Positive? 4. Wealth, Education and Occupation: How to Understand the Data on Socio-Economic Characteristics and HIV Status 5. A New Role for Economics in Understanding HIV Perevalence Part II: The Economic Impact of AIDS: The Past the Present and the Future 6. The Economic Impact of Disease: Good or Bad? 7. The Impact of AIDS on Farms and Firms 8. Understanding AIDS Impacts on Individuals and Hoseholds 9. A Political Economy Perspective on the Economic Impact of AIDS 10. A New Approach to Economics? Deborah Johnston is Senior Lecturer in Development Economics at the School of Oriental and African Studies, University of London, UK.